I hope everyone enjoyed the first full weekend of fall. Unfortunately, it did not feel like a change in seasons around my parts. I think summer temps may be sticking around for a little while longer. At least we aren't in the 100's anymore. I did some fall things, just to feel like I sort of fit in around the country. Before we move along any further, you MUST take :30 seconds out of your day and watch the video of Landry (my youngest). I promise, it will make smile, possibly laugh and hopefully make your Monday a little brighter. Pinky Promise. Lady Gaga, eat our heart out! Click on the image or here. See, I told you so. Just another proud momma moment to chalk up. We don't call her Sparkle Monkey for nothing. 2. See that Love bracelet. Isn't it the cutest? I won it in a giveaway from Jamie over at Forever81 and it just came this weekend. 3. First Day of Fall Rule: Drink a pumpkin flavored beverage. It's pretty good, but I must say, it needs some sort of added kick. 4. Saturday night boredom set in. So, when a girl is bored, what does she do? She paints her nails of course. I picked up this deep gray-green color at Marshall's for $4.00. Holla! It's Essie Power Clutch. I think it's my new fave. 1. Weekend wearings. Not very fall-ish, but it was hot outside. 2. Weekend purchases from Forever 21 and Kohl's. A dress for a wedding this coming weekend, suede clutch, leopard cardigan and "Weekend Warrior" t shirt. I must say the shirt is my favorite find. 3. All Landry has talked about for the last few weeks is wanting to be a witch for Halloween. Well, she got her wish. Halloween costume has been purchased. Now, we are on the hunt for Logan's. Can I just say that the little girl costumes that are out this year are straight up HOOCHIE? And the kids on the covers, modeling the costumes look like something from Toddlers and Tiaras. No thank you. I can already tell it's going to be a battle this year. Lucky me! Who wants to come hang out for drinks in my yard? EEEEEEEK!!!! And there is an entire Brady Bunch family of the lizards in my bushes. It's like the are multiplying by the day. Gives me get the chills even as I am typing. Last, but definitely not least....GAME DAY! 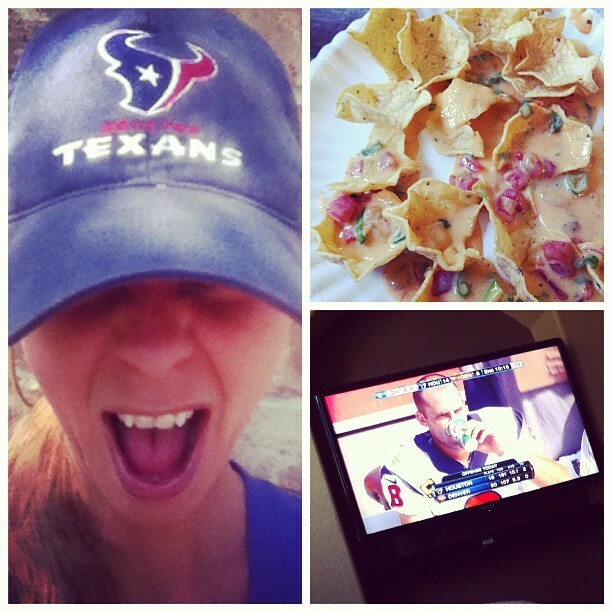 There isn't a better way to end the weekend than with the Texans and some chips and queso. Sorry, Broncos, but that's what you get for roughing up our QB. Can you say #1 in the NFL?!?!? P.S. 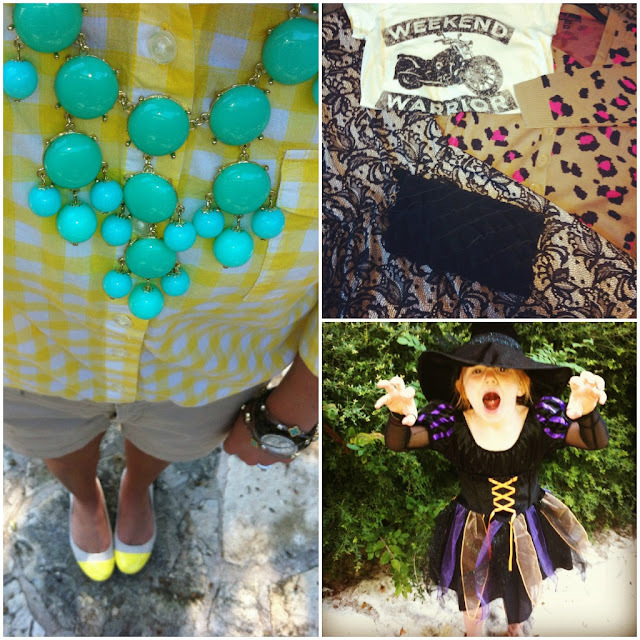 I am over at Emily's blog, Creamy, today talking about some of my favorite fall trends. Go take a peek. September Group Giveaway is going on. Take a peek here. 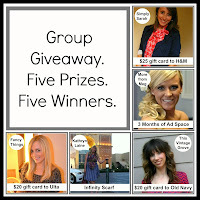 Five ladies, five prizes! Make sure you enter! I am linking up with: Leeann, Dana and Sami for the Weekend Update. Molly for YOLO Mondays. Go visit them! i heard your Texan's won, congrats! And wtf, are you growing a zoo in your backyard?? EEK is right! too many things to comment on!! I can't watch that video because my husband is next to me sleeping but I will be back! :) and I LOVE your outfit of course. and I need to go to kirkland's! I haven't had a pumpkin beer yet. I, like you, am left pretending that it's fall. I did so with fall candles this weekend in the 90* sweltering heat. We have a brewery here in Tampa called Cigar City, and I heard their pumpkin beer is supposed to be pretty good. I like your outfit! The cap toe shoes are very pretty! I love that nail polish! I'm such need of fall colors that I might have to go out on adventure and find some! I love blue moon but not sure I'm brave enough to try to the pumpkin flavors. I am so picky and have a weird taste for beer not sure i want to waste money on it and not like it!!! I love everything about this post!! I love Landry & her video, she cracks me up!! I completely agree of course with it not feeling much like Fall around here. I think I need to decorate some and get in the spirit of 100+ degree days being over! Love your outfit, nail polish and of course that queso from game day! I think I might need queso for dinner tonight :) Have a great Monday Shanna! My sister called me in a panic the other day. Why? 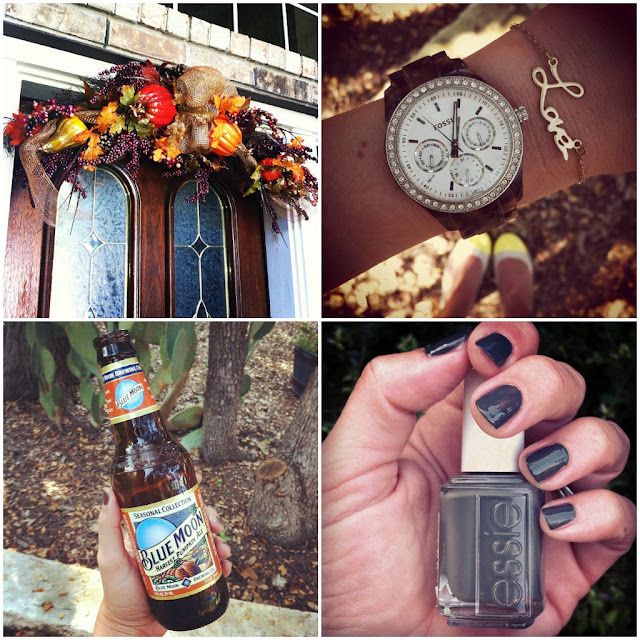 "OMG ESSIE NAIL POLISHES ARE SUPER CHEAP AT MARSHALLS. YOU MUST GO NOW!" So I did. It looks like you did too. I'm a Blue Moon fan through and through, but I was disappointed with their pumpkin fall seasonal. Now I have a ton of it at my house and need to find someone to drink it all for me! I enabled follow-up comments. Thanks so much for letting me know if that issue. Omg, the video, it definitely made me smile! Love that you got the essie polish for $4, what a great find. Love that color! That video made my morning. So cute! Looks like your house is in full fall/Halloween mode! it is definently who I cheat on my soon-to-be husband with every Saturday. if you join their mailing list they send you a 25 off of 75 coupon. What other reason do you really need than to go spend 75 dollars on awesome stuff for your house?! I did some serious damage this weekend that is for sure! love love that wreath, and that little girl of yours! Knowing it was the first full weekend of fall made the measly 90 degree weather feel hotter than the 100 degrees we had this summer!! I long for cool, brisk air daily! Oh my! Sparkle Monkey! HAAA! Im gonna have to get me some. I have to wait till I get home tonight to watch the video.. but I will! I LOL'd at your statement "when the hell did Hobby Lobby get so proud of their stuff?" hahahahha. EXACTLY! I feel exactly that way about all those craft places! You said it, perfectly! I'm at work and I can't watch the video! Boooo. I'll have to watch it when I get home tonight! Looks like a great weekend!! I love how you got all festive this weekend with the arrival of Fall!! I had my first Sam Adam's Oktoberfest of the year on Saturday for the same reason :) The creatures living in your backyard freak me out!! But on a happier note, I LOVE that nail polish and your new "Love" bracelet! Have a happy Monday!! Landry is SOOOO adorable!!!! Does she have strawberry blonde hair? I love it!! And love that you call her Sparkle Monkey. I am really digging that nail polish, too! That video...oh my goodness!! Loved it! Where did you find that dress?! Too cute. Fall wedding dresses are so hard to find, IMO! Have a great week, sassy pants! You and your outfits, your hot nails, your adorable kids and your sweet southern accent make me want to come down to Texas and hug you. And then drink a lot with you, obviously! go texans! :) and i love that love bracelet! :) you've got great style! oh my god. that is too cute.. and i even watched your makeup tutorial after! loved it! definitely going to look into what you use! Lizards? And you have not found a way to make them into handbags to sell at F21 because they need to be later tater or I ain't come in to visit. Your pictures show how much fun your life is! Found you on the link up! Newest follower! I screamed when your QB took that hit. It was awful! I tried the caramel apple spice blue moon this weekend! It was okay. A little weird. What the hey--since when does Hobby Lobby carry such expensive things!? Puhlease...that swag is fabulous though. Better than a $240 wreath! I've been debating on trying that pumpkin beer--is it worth it?! Love your weekend updates...always SO FUN! Happy Monday, love! You have the cutest clothes/accessories/life/hair/kids etc etc. um. i NEED that love bracelet! so cute! Omg she is the CUTEST. And that costume? Adorable. Do NOT like those creepy crawlers. There's a reason I live in the city with NO yard. Eek! Love your new bracelet...it's pure perfection. And the shopping stuff...so cute! Love that Essie color too! Omg I am obsessed w that polish color! Love! Game days always look so much fun!! Your girls are awesome! Wait, $240 for a Hobby Lobby wreath? WTF? 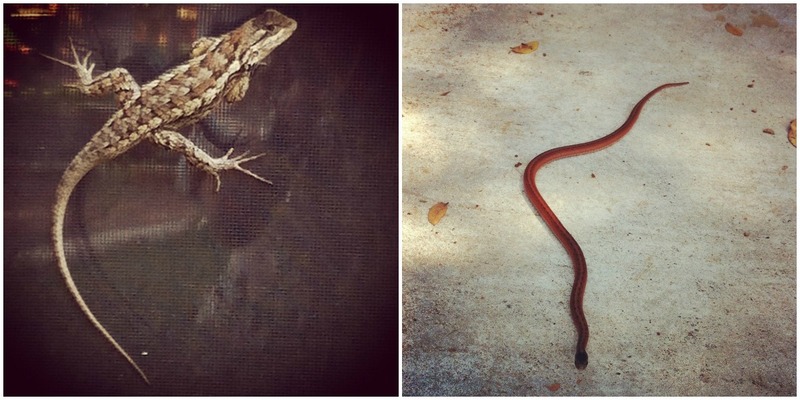 You always have the craziest creatures in your backyard!! That video of Landry seriously cracks me up!! Too cute. Giveaway - Who is Jessica Who?